It was inaugurated on October 31, 2006 by Minister of Culture Abel Prieto. 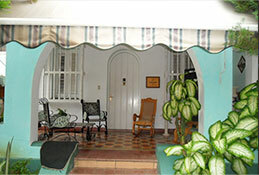 Compay Segundo lived in this house during the last years of his life, together with his younger son, Salvador Repilado and his family. The museum exhibits Compay’s personal belongings, musical instruments that he played during his artistic career, from the clarinet that he used in the Santiago de Cuba Municipal Band, to his armónico, the instrument that he himself created. Also on display are the national and international awards and distinctions he received. There is a wide range of photographs from different stages of Compay Segundo’s life, as well as family photos, and photos of friends and fans from all over the world. We would like to show those who visit our museum the roots and origin of Compay Segundo’s music. You will have the opportunity to see original sheet music from his private files, some of his personal belongings, his armónico. And above all, you will be welcomed with the same hospitality with which Compay received his friends and fans. Open to the public Monday through Friday, from 9:30 am to 3 pm. For prior coordination call 206 8629 and 202 5922.